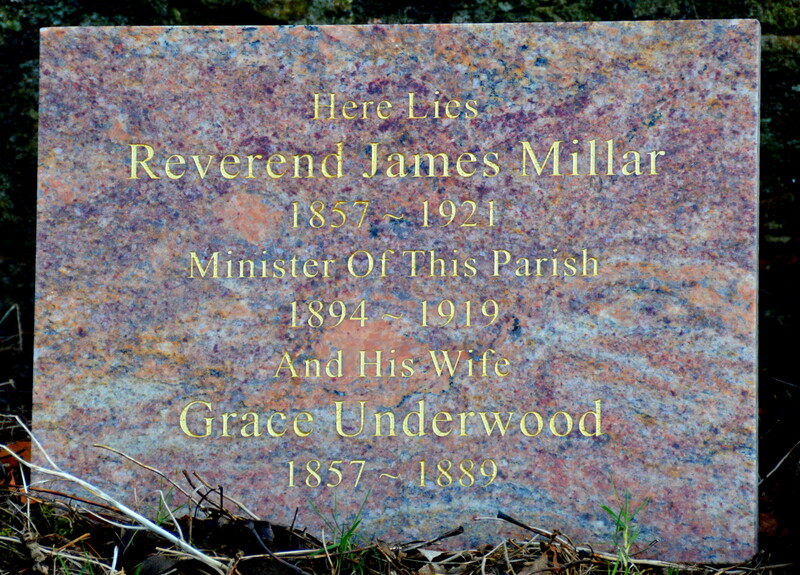 Unfortunately the original small cross headstone that marked the resting place of the Reverend James Millar and his wife Grace Underwood Kennedy has been irreparably damaged. As part of the project a new memorial plaque has been placed beside it. James Millar was born in Shawlands the son of Archibald Millar and Agnes Smith. His father was a teacher at Crossmyloof at school, where James was later educated. A student at Glasgow University he graduated with a Master of Arts (1879) and a Bachelor of Divinity (1884). In 1883 he was appointed as an assistant to the Reverend James King at New Kilpatrick, Dunbartonshire. Three years later in 1886 the Reverend James Millar was appointed assistant and successor to the Reverend Robert Murray, now approaching 70 years old. James Millar moved into the manse while the Reverend Murray retired to Beechbank Cottage, Ayr Road, Cumnock. Joining James in the manse was his wife Grace Underwood Kennedy, the newly weds having being married the year before at Partick. Grace was the daughter of Walter Kennedy, stationer in Partick and of Muirkirk-born Elizabeth Thomson, the daughter of a colliery manager. In November 1888 a son Archibald was born in the manse and in October the following year a daughter Grace was born there too. Sadly mother Grace died within a few weeks of giving birth and was laid to rest in the Auld Kirkyard, New Cumnock. Following the death of the Reverend Murray (designated senior minister) in 1894 the Reverend James Millar formally succeeded him as the minister of the parish of New Cumnock. As well as tending his flock the Reverend Millar was an accomplished musician and compiled texts on church music . He was also a German scholar and translated several relgious works from German into English. The Reverend Millar’s daughter Grace followed her father’s love of music and as a Licentiate of the Royal Academic of Music she offered lessons on the pianoforte at the manse. His son graduated from the University of Glasgow and follow a career in medicine. During the Great War he served as a Captain in the Royal Medical Army Corps and in 1918 he received the Military Cross in the New Year’s Honours List. The following year the Reverend James Millar stepped down as minister due to ill-health tin 1921 he died at his son’s house in Lancaster. He lies buried against the wall of the Auld Kirkyard alongside his wife Grace.